After a summer filled with recalls, it seemed like the roll of sickness was slowing. But unfortunately it's time to check "used by" dates once again. The latest food you have to worry about betraying you is cake mix, which feels particularly unfair. 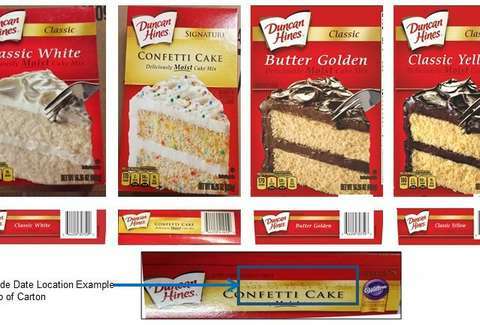 There are four varieties of Duncan Hines cake mixes being recalled. ABC 7 reports that samples of the mix tested positive for salmonella that could be related to an outbreak that the Center for Disease Control & Prevention (CDC) and the Food and Drug Administration (FDA) are investigating. The recall includes the Classic White, Classic Butter Golden, Signature Confetti, and Classic Yellow mixes. Thus far, five people have reportedly fallen ill after eating the cake mix. For the full list of "used by" dates that could potentially be dangerous, click here, where it's broken down by each mix. Salmonella is no joke and can be potentially fatal for young children, the elderly, and others with weakened immune systems. The press release from Duncan Hines about the outbreak suggests returning any boxes to the store at which they were purchased. You can also fill out this form to get a replacement coupon.